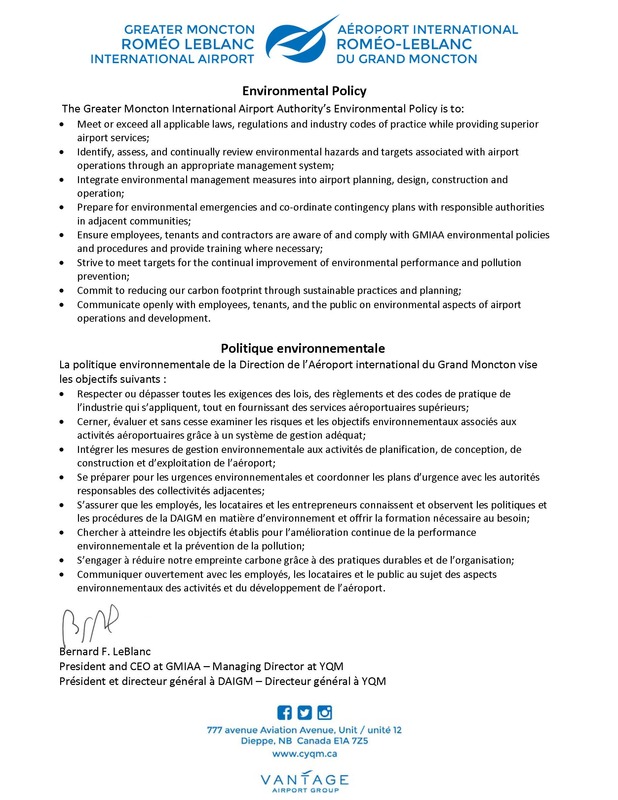 The Greater Moncton Roméo LeBlanc International Airport (YQM) is committed to safeguarding the environment by minimizing the impact our operations may have on our surroundings. We accomplish this through policies and procedures that are integrated in the Airport Authority’s culture. With an Environmental Management System based on ISO 14001, YQM is committed to not only meeting federal environmental regulations but striving to exceed applicable requirements and standards. We do this through our commitment to continually improve our environmental performance. Our environmental policy is the foundation of our Environmental Management System and the points are implemented through the effective management of this system. Communicate openly with employees, business partners, and the public on environmental aspects of airport operations and development.